Another exciting update has been implemented that I’m really excited to share with you. We have added a donut chart to the Lead Bucket which helps exemplify the weight of different mediums as you filter and search through your leads. Who doesn’t like donuts!? 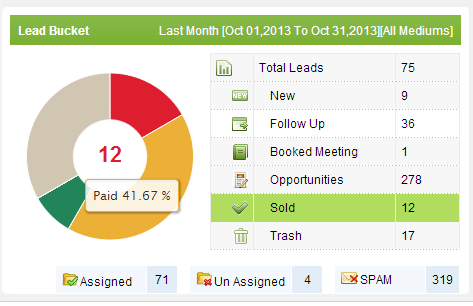 This is a very insightful feature as it helps paint a picture on which mediums are bringing you the best leads. Most importantly, you can see which mediums are converting to sales! This update is all part of our efforts to bring you better data that helps you make better data-driven decisions. This is also the first step in a movement to better measure sales within AdLuge. Over the coming months, we will be adding the “Customer” metric to our reporting to further exemplify the performance of your marketing efforts across all mediums. Please feel free to reach out to your Account Manager if you have any questions! Don’t have AdLuge? Contact one of our solutions specialists today! As always, stay tuned to our blog for regular AdLuge updates and informative articles to help you make smarter marketing decisions.